Chestnuts are so festive, I don’t know if it’s because they are at their best this time of year, or if it’s due to the fact they need a bit of work to really make them shine. Whatever it is, I really have grown to love them, chestnuts are a very recent thing for me, I’d never eaten them until a few years ago when my boyfriend bought a bag from the supermarket and roasted them in the oven. He’s not much of a cook and in hindsight, he didn’t cross the bottoms to make them easier to peel, we didn’t have any idea how long to cook them or at what temperature and a few did explode in the oven. The few that we did manage to save were delicious though. The chestnuts in this recipe are pureed and I used Merchant Gourmet‘s chestnut puree, it’s a great unsweetened puree meaning you can use it for so many things. 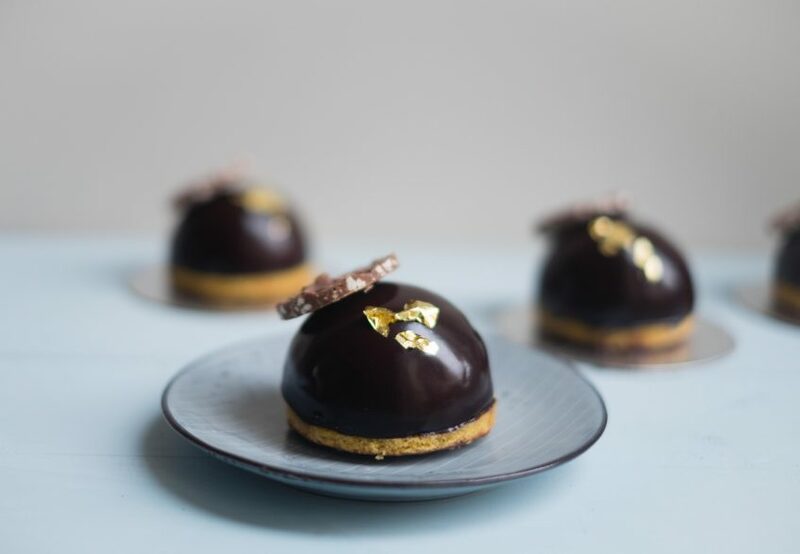 These domes are made up of a chestnut mousse on top of a disc of hazelnut chocolate, surrounded by chocolate mousse and chocolate glaze, sat on a sable breton. 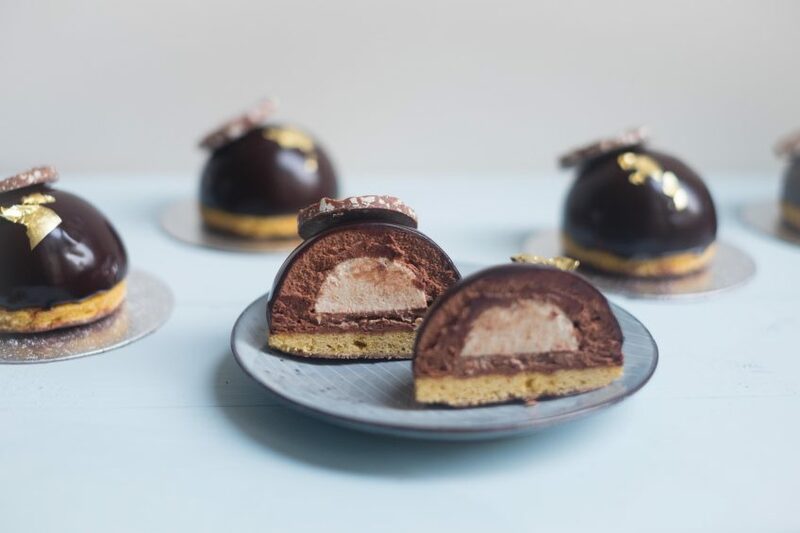 These domes were inspired by my chocolate & chestnut buche de noel. These are very similar, but much easier to make and all you need is some silicone moulds and it makes them look so impressive. If you’re feeding a crowd, you can easily double up the recipe and these can be made in advance, so you don’t need to be in the kitchen while you have guests. Don’t be put off by the length of this recipe, it can all be made in batches over a few days and it all keeps well, to make them you will need a 6 cavity silicone pastry mould with a 7cm diameter and and this 15 cavity semi-sphere mould. To make the recipe even easier to complete a stepped palette knife and cake cards for presenting your dessert on will help. All aspects of this dessert can be made independently and in advance. The chestnut and chocolate mousses can be made ahead and frozen for up to a month. The simple syrup and glaze will keep for about 3 days in the fridge, the sable breton dough can be made and kept rolled out in the freezer for a month. The chocolate discs can be made a week in advance and stored in an airtight container. Begin by making the sugar syrup, put the water, sugar and vanilla extract in a saucepan. Bring to the boil, and cook for 2-3 minutes. Next make the chestnut mousse, Soak the gelatine in a bowl of ice cold water for a few minutes until soft. Place the unsweetened chestnut puree in a pan with the syrup and bring to the boil. Take off the heat and add the soaked gelatine, squeezing all of the water out before adding it. Mix well and pass through a fine sieve, then leave to cool to room temperature. Mix in the dark rum and then fold in the semi-whipped cream. Fill the small hemisphere moulds that are 3cm diameter and freeze for at least 2 hours. 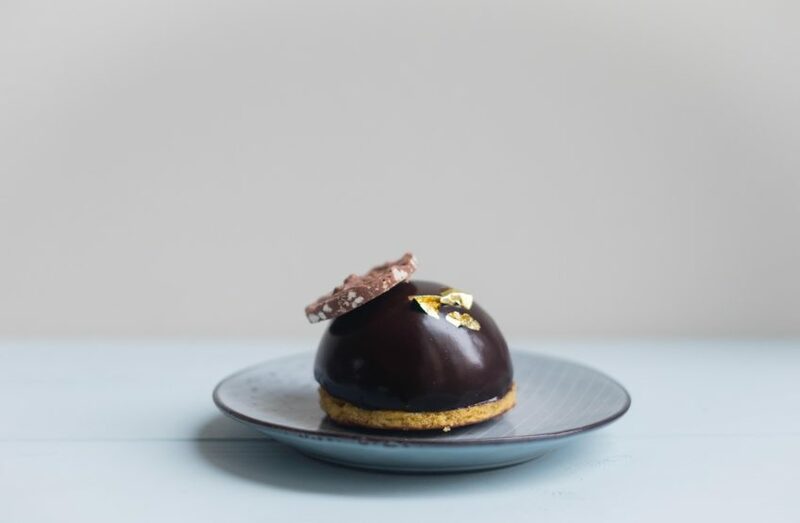 Next make the chocolate hazelnut discs, melt the chocolate and mix in the chopped hazelnuts, spread the mixture onto a silicone sheet and leave to set hard. Take a 3cm round cookie cutter and stamp 12 circles, store them in an airtight container till you are ready to use them. To make the sable breton, put the plain flour, salt and baking powder in a bowl and mix together. Put this to one side. Put the sugar and egg yolks in the bowl of a stand mixer and beat until light and pale. Add the softened butter and mix, the mixture may look curdled, but this is fine. Then add the flour mixture and mix on a low speed until combined. The dough will not completely come together, tip the dough out onto a sheet of baking parchment and knead it into a ball. Place another sheet of baking parchment on top and roll the pastry out to a thickness of 5mm. Place the dough in the freezer for 20 mins to rest. Preheat the oven to 180C/160C fan/gas 4 and take the pastry from the freezer, peel off the top layer of baking parchment. Place the pastry in one piece on a baking tray and bake in the oven for 12 minute until it becomes golden. As soon as the pastry is baked, take a 7cm round pastry cutter and stamp out 6 circles from the pastry. Transfer the circles to a rack and leave to cool. To make the chocolate mousse melt the chocolate in a bain-marie until it reaches 45C. Whisk the egg yolks in an electric mixer fitted with the whisk attachment. Meanwhile put the sugar and water in a saucepan and bring to the boil. Heat until it reaches 121C, then slowly pour the sugar syrup over the egg yolks and continue to whisk to a full sabayon. Continue to whisk the mixture until it is cool. In a separate bowl whip the cream until it reaches the ribbon stage, then fold the sabayon into the cream. Carefully fold one third of this mixture into the melted chocolate. Fold in the remaining cream. 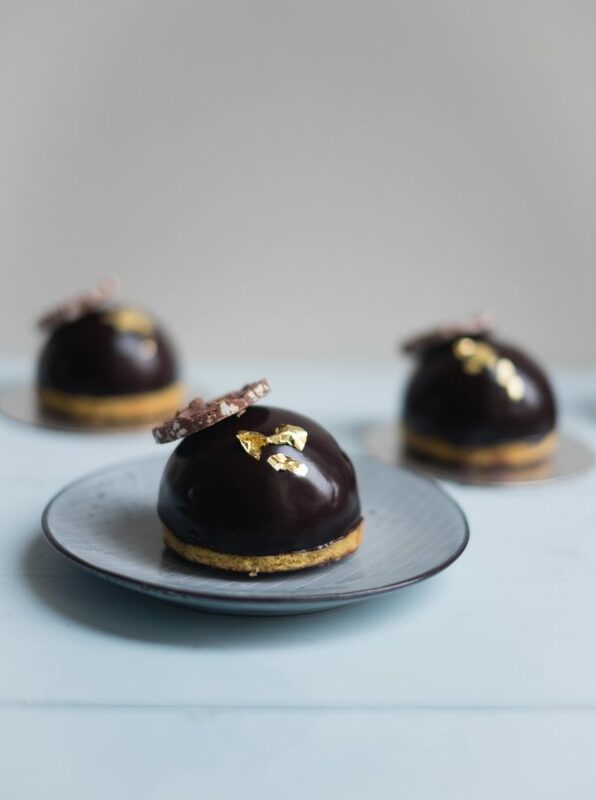 Next assemble the domes, take the 7cm diameter silicone moulds and spoon some chocolate mousse into the mould, using a stepped palette knife, smooth the mousse up the sides of the mould. 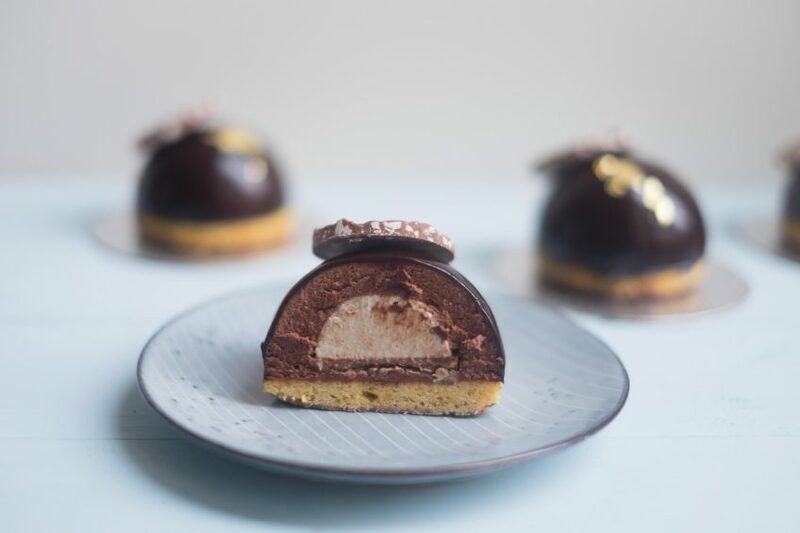 Place in the frozen chestnut mousse semi-spheres and push it down a little, place a chocolate disc on top and then fill the mould with the remaining chocolate mousse. Repeat this with the remaining 5 moulds and place them in the freezer for at least 2 hours. Finally make the dark chocolate glaze, soak the gelatine in a bowl of cold water for a few minutes until soft. Squeeze out the excess water. Put the water and sugar in a saucepan, bring to the boil, then continue to simmer over a low heat for 2-3 minutes. Add the sifted cocoa powder and the cream, mix thoroughly. Bring back to the boil and simmer for 4-5 minutes. Take the pan off the heat and add the pre-soaked gelatine and stir until dissolved. Strain then leave to cool. When the domes are frozen, take them out of the moulds and place them on a cake rack with a baking tray underneath, take the glaze and warm it to around 35C-40C and then pour it over the mounds until completely covered. When the glaze has finished dripping place a dome on top of a sable breton on the flattest side. 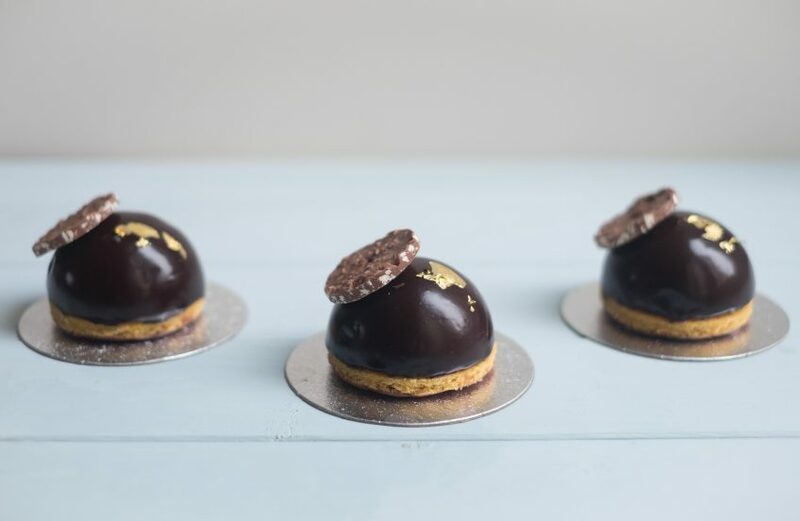 Take the remaining 6 chocolate discs and place them on top of the domes at an angle. Decorate with gold leaf. Hope all of your Christmas and New Year preparations are going well, let me know what you’re up to in the comments. Some of my links are Amazon affiliate links. These means if you decide to buy any of these products, I will make a small percentage from the sale. Just found your blog – just what I needed. Started playing with Patisserie about 6 months ago as a baking hobby and I’m hooked. Such great inspiration and I’m very keen to try something with a nut mousse. Love my dome molds – they always look impressive . Thank you for this recipe. Hi Jeanie – Thank you so much for taking the time to comment. Dome moulds are great aren’t they? Enjoy the recipe and let me know if you make it. These are so festive Jodie and so light and delicious. You should definitely try roasting some chestnuts this christmas. Chesnuts are my favourite to have at this time of year and these little domes are too perfect. Thank you! I love chestnuts, even just roasted they are one of life’s simple pleasures! They are beautiful and I love chocolate and chestnut together, they would make a perfect dessert for Christmas! Thank you Hannah – I am so pleased with how these turned out. They taste great and you’re right, they’re perfect for Christmas. Ooh chestnuts are so good aren’t they? So glad you like the look of these, I was so pleased with how they turned out. Thank you Thalia and thanks for coming to my blog and commenting! You have to definitely use your moulds they really make your desserts look so impressive and you can cook cakes in them too! Wow! What stunners these little domes are! I’d expect to see these at my local Godiva store – simply exquisite! Thank you for such amazing comments, I love Godiva chocolate, so I am really flattered that you think this would be at home there! I didn’t know that chestnuts could explode if you failed to make an x on them! That is too funny. These domes are so sophisticated! 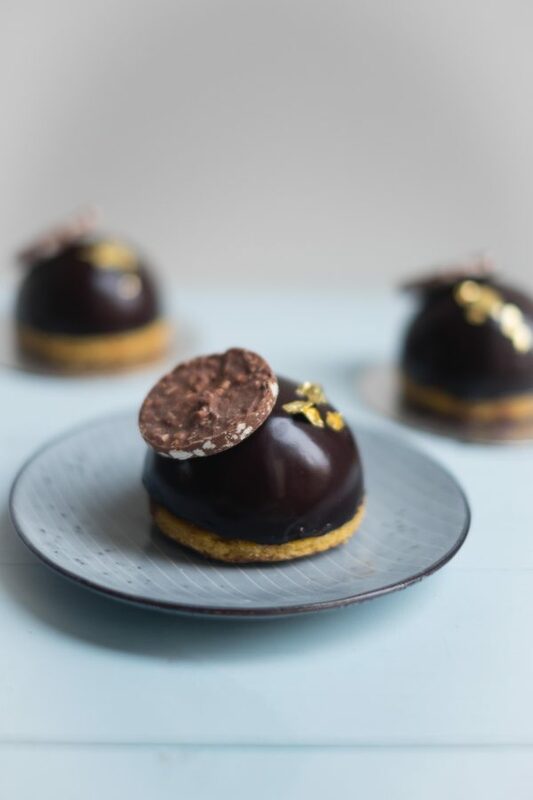 I think we may have cooked them a bit too long and they turned into little bombs 🙂 These domes are so easy to make and they really do impress, you’re so right! I’m totally impressed! Gorgeous!! I’m sure delish! Thank you Shelby, you’re right, they are so tasty! These are beautiful! I love that there are so many chestnuts around this time of the year. Thank you Tina – I just love chestnuts so much too! They are so versatile. Wow, these are stunning and look absolutely delicious. Perfect for a Christmassy treat. Thank you so much, you’re right they are perfect for Christmas and taste so lovely.